Once coffee is harvested, or better described as, according to what we’ve learned, the cherries are picked, they go through further processing before roasted and sold. Let’s dive deeper in each method. Also known as the unwashed or natural process. In this process, the newly harvested coffee cherries are sorted and sun dried. This is the oldest method of processing coffee. The entire cherry cleaned and then placed in the sun to dry on tables or in thin layers. The harvested cherries are usually sorted and cleaned, to separate the unripe, overripe and damaged cherries and to remove dirt, soil, twigs and leaves. This can be done by sorting, which is commonly done by hand, using large kind of strainers. Any unwanted cherries or other material not sorted out can be picked out from the top of the strainer. The ripe cherries can also be separated by flotation in water channels. The coffee cherries are laid out in the sun. As the cherries dry, they are raked over or turned by hand to ensure even drying. It may take up to 4 weeks before the cherries are dried to the optimum moisture content, depending on the weather conditions. On larger plantations, machine-drying is sometimes used to speed up the process after the coffee has been pre-dried in the sun for a few days. The drying operation is the most important stage of the process, since it affects the final quality of the green coffee. A coffee that has been overdried will become brittle and produce too many broken beans during hulling. Coffee that has not been dried sufficiently will be too moist and prone to rapid deterioration caused by fungi and bacteria. It is the most natural way of processing using least resources of water or energy. When this process is carried out properly, it can result in a smooth flavour and heavier body. Naturally processed beans are generally more inconsistent in quality given that every bean is its own closed environment of varying levels of sugars and alcohols. To handle these variables in certain parameters is time-consuming, labor-intensive and requires a lot experience. Due to changing weather and climate conditions there is always the risk of loosing a complete harvest. This method is a bit of a newer method, and is most commonly used in Brazil and Indonesia currently. It can also be referred to as ‘wet hulled’ and ‘semi-washed’. In this process, the coffee cherries are mechanically removed by a pulping machine, the mucilage is then washed off, and the beans are laid out to dry. This method also called “Honey”. In this process the outer skin from the cherries are removed mechanically, using pulping machines. The coffee beans, still coated with mucilage, are then stored for up to 24 hours. After that time the mucilage is washed off and the parchment coffee is partially dried in the sun at 10% to 12% moisture content. The risky part during the semi-washed process method are bacteria, naturally existing on the surface. Fermentation can start immediately as honey dried coffee beans have a remaining sugar-layer which is vulnerable to any sort of mold and offers best feeding resource for bacteria. 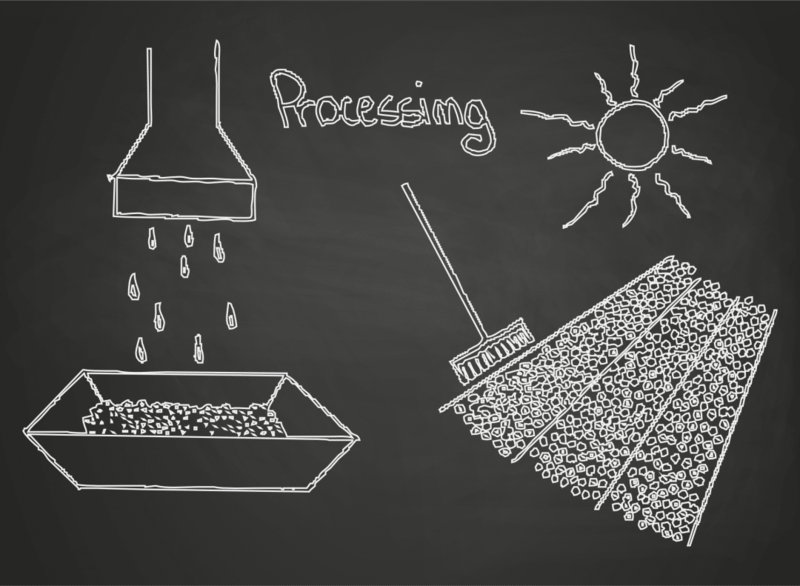 Drying carefully with supervision is crucial to the success of this processing method. The beans must be raked 2 – 3 times per hour until they are dry enough not to stick together, all in all this takes in average 6 – 8 hours. More raking than average is often required beyond this point to ensure nothing rots nor ferments. Once the beans reached a sufficient moist level, they are dry milled to remove the parchment layers. Honey processing bridges the gap between washed and natural coffees as it generally possesses some of the body and sweetness of a natural while retaining some of the acidity of a washed. Honey coffees often have a syrupy body with enhanced sweetness, round acidity and earthy undertones. Due to the additional “middle steps” it is easier to produce consistent quality. The time needed for processing is shrunk. More equipment and knowledge is needed to control the process. The pulp is broken down by microbes when the cherries are fermented. Basically the fermentation process breaks down the cellulose in the pulp to reveal the coffee beans. Then, the cherries are washed to further separate them from the pulp. The approach is to break down the cellulose by fermenting the beans with microbes and then washing them with large amounts of water. Fermentation can be done with water or in the fruit’s own juices. The fermentation process has to be carefully monitored to ensure that the coffee doesn’t acquire undesirable, sour flavors. Mostly fermentation takes between 18 and 36 hours, depending on the temperature, thickness of the mucilage layer, and concentration of the enzymes. The end of the fermentation is assessed by feel, as the parchment surrounding the beans loses its slimy texture and acquires a rougher feel. When the fermentation is complete, the coffee is thoroughly washed with clean water. Using this method the coffee cherries are mechanically scrubbed in order to release the coffee beans. In machine-assisted wet processing, fermentation is not used to separate the bean from the pulp because this is done by mechanical scrubbing. This method is suitable to cope with large amounts of coffee beans and process them in an industrial way. You can discuss if this is a method fitting to a natural product. There isn’t any real craftsmen needed because the process has not to be controlled as much as fermentation. On the other hand this method reduces the risk of wrong preparation or environmental hazards. This method avoids the huge use of water and resulting remainders of fermentation which heavily can damage the environment. The use of heavy equipment and energy is mandatory. We’ve learned the three general methods of processing, their different approaches and their pros and cons. There doesn’t exist the one and only best method because the farmers or producers must take into account their local circumstances as climate and risk of inconstant weather as well as the availabilities of machines, energy, know how, experience and last but not least their customer’s demands. I hope you enjoyed these insights in coffee processing and I’m happy to announce the next part of this series in which I’ll describe grading and blending.